We have been having trouble sorting through the rumors surrounding the Samsung Galaxy Note III, because original reports had the device launching with a 6-inch display, while more recent reports have been saying it will be a 5.7-inch display. It turns out that both may be right, because the new theory is that the Note III will launch in multiple sizes. Indian import/export database Zauba, which also recently listed a possible 12.2-inch tablet from Samsung, has multiple listings for the Samsung Galaxy Note III, but the interesting thing is that the site lists different models of the Note III as having either 5.5-inch, 5.7-inch, or 6-inch displays. The only hitch is that the listings mark all of the models as either "for R&D purpose" or "for testing & evaluation & not for retail sale". This could either indicate that Samsung is still testing different prototypes and hasn't yet chosen a final size for the Note III, or it could mean that there will be multiple sizes for the device. If there will be various sizes, which one would you choose? 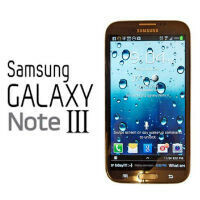 I dont know about you, but Im ready for Samsung to reveal the Note 3 now. Im tired of the rumors and ready for the real thing!!! Because there are three main races in the world - Caucasoid, Mongoloid, and Negroid. I'm sure you can figure out which one Asians fall under. Says the retard who knows nothing about race. How do you know how big his hands are? squallz506(comment of size)/moroninc(comment against racism)X Note III size = size of hands. I'll take two double sized Note 3 with the smaller one for my girlfriend. 1 S4 duos for my dad, 1 S4 active for my bro, 1S4 mini for my mom and the S4 zoom for my photographer friend...and make it HOT with extra cheese please! Just don't read those rumors. Just wait for their conference like I am. I doubt it will get shown off at IFA 13'. Remember that Exynos 5 Octa was broken because it had a non functioning cache coherent bus. I just read on Anandtech that it's been fixed on the new Exynos 5 Octa. This means that battery life will be much better on the Note 3 if it gets the new Octa. I also saw on gfxbench.com that Adreno 330 is much faster than Tegra 4's GPU so the Snapdragon version of the Note 3 will be an outstanding performer too! 5.5 inch is the note 2 refresh or possibly the budget note 2 with snapdragon 600 installed. Any news on 7 inches??? lol .... welcome to 2013! Seeing as the US and UK both have LTE, I'd say we will both get a 5.7 and 6 inch version. If such a size variation exists, the 5.7 inch is the budget version and the 6 inch is the premium version, i sincerely hope this is true as i wasn't going to settle for a small 5.7 inch screen. Just like Samsung has the Galax Tab (lower end) series tablets along with the Note tablets (premium), there is the Galaxy Mega (low end) and the Note phablet (premium). i hope they go 5,5. Agreed! We've seen Samsung create s series mini versions, why not a Samsung Galaxy Note III mini version. They might be researching the right screen size. asian markets getting 5.5" plastic version? (without xenon flash) US/European markets getting aluminium design with xenon as standard? the thing is..if samsung is going to unveil note 3 on sep 4th..they have already testing it on a day to day basis..i mean the phone is already being assembled and going through final testings..